Fresh figs are a rare treat in my house…they are not so hard to find at the shops when they’re in season, but they don’t come home with me often. I was excited to buy a pint to make this cake with TWD. Beneath these flashy ruby port-poached figs is an appealingly rustic and sturdy cake, flavored with honey and cornmeal. I brushed a little of the reduced port syrup on top of the figs after the cake had cooled. Whipped cream on the side was a must. For the recipe, see Baking: From My Home to Yours by Dorie Greenspan or read Cookie Rookie. Don’t forget to check out the TWD Blogroll! What a beautiful cake. 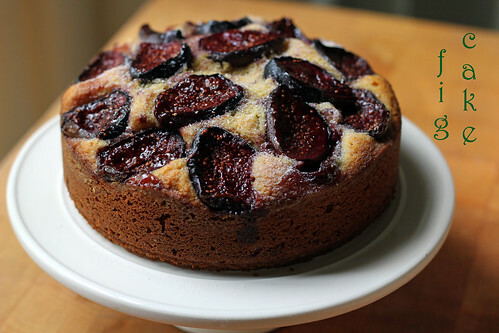 I have yet to bake with figs, looks delicious. You could probably give me some tips on figs since I know nothing about them! Your cake is so tall and beautiful. I think I’ll try some whipped cream on my next slice too! This is such a lovely cake. I really liked this even though I wasn’t sure about the figs. Yum..it looks so good. Next time I will make mine with figs! Everything is always better with Whipped cream!! Wow – gorgeous, gorgeous figs! amazing colors. this one really POPS! in presentation. Do you think it could be made with something other than figs or even plain? Yours looks fantastic. yes, i think someone on the TWD forum mentioned making it with plums. Yours looks so pretty! Glad you gave the figs a try. Thanks for baking with me! Seriously one of the prettiest photos I’ve ever seen. Fresh figs are definately a treat. This was my first time baking with them. Agreed on the whipped cream. I didn’t get a chance to go get figs (been so busy getting my daughter’s birthday cake together) but your cake looks so lovely!